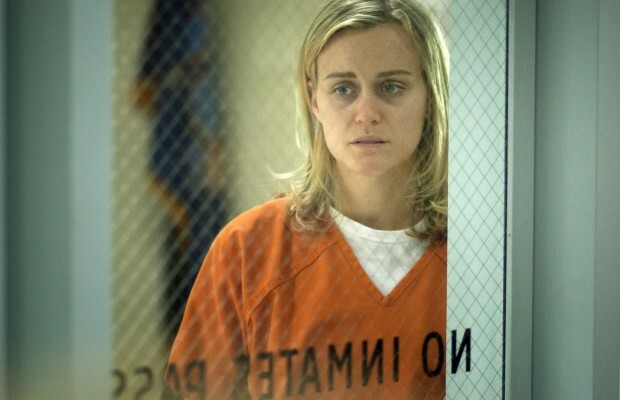 “Orange is the New Black” star Taylor Schilling recently ditched the show’s signature beige jumpsuit to star in the summer comedy “The Overnight.” In it, Schilling plays one half of a couple who move to LA and end up having an overnight adventure with another couple who wants them to take part in some group sexual antics. Taylor Schilling: Middle of June, I think. As of now, we go back for the 4th season. I just- I’m really excited to see everybody spreading their wings. I think Jenji [Kohan] is just so brilliant, and just keeps pushing all these characters to their whits end. The book “Orange Is the New Black: My Year in a Women’s Prison” was just the one year in prison, so the show has gone way beyond that. Did you ever sleep overnight at a prison? Schilling: No, I’ve visited. Before we started the first season, I made a decision to not go to any prisons. Then, before shooting the second season- around the time I think we finished our movie [“The Overnight”], I spent some time at Rikers with Piper [Kerman]. Schilling: She was in Connecticut at Danbury with Martha Stewart. I don’t think they actually overlapped. Yeah, it’s very powerful. The interesting thing about the time that I spent in the prison- and I’ve spent some time with the Women’s [Prison] Association now- and they just do such magnificent work. But the parallels between what our show is doing and what’s really happening even aesthetically, like being in Rikers, and the women’s camp- is so spot on and its bone chillingly accurate. It’s exciting work.